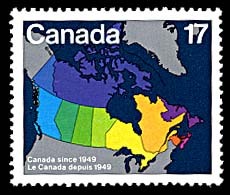 Your "one-stop" shop to learning and understanding more about Canadian philately. Canada Post has put together a three minute video in both English and French promoting the Reflections of Canada exhibition opened on July 1, 2002 in Ottawa, Canada by the Prime Minister of Canada, The Honourable Jean Chrétien. Charles J. G. Verge, Past President of The Royal Philatelic Society of Canada, the curator of this exhibit, is the narrator in the video. How much do you read about stamp collecting? Many stories are heard of collectors who have made wise purchases from stamp dealers because the collector knew more about their specialty than the dealer did - are you one of these collectors? Here you will get a fairly detailed list of Canadian-related stamp books and journals. Check your local dealer or on-line stamp dealers. Click for a list of Canadian philatelic literature. Want to learn more about Canada, its Provinces, and geography? Here you will find maps of Canada and its provinces - useful information for the non-Canadian to get a feel for where various places are in Canada. A list of all of the Canadian Prime Ministers and illustrations of the stamps they have been portrayed on. Click for Canadian Prime Ministers.